Ryan O'Reilly and the Blues are taking on the Winnipeg Jets in the first round of the Stanley Cup Playoffs. 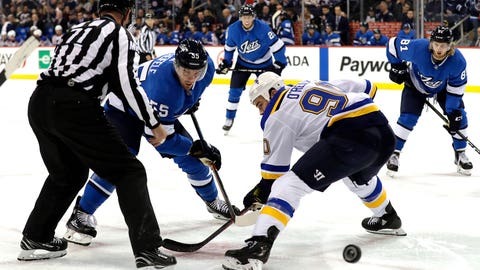 FOX Sports Midwest, the television home of St. Louis Blues hockey, will televise the Blues’ first-round Stanley Cup Playoff series against Winnipeg. The series continues Thursday with Game 5 at 7:30 p.m. on FOX Sports Midwest. Coverage begins at 7 p.m. with the Blues Live pregame show. Game 6 at Enterprise Center is scheduled for Saturday at 6 p.m. and will also air on FOX Sports Midwest. Blues Live pregame starts at 5:30 p.m.
FOX Sports Midwest will air the Blues Live postgame show after all games, including those televised exclusively on national TV. All games and shows televised on FOX Sports Midwest will also stream live on the FOX Sports app, FOX Sports GO and FOXSportsGO.com. John Kelly (play-by-play) and Darren Pang (analyst) call the action on FOX Sports Midwest. Bernie Federko, Jamie Rivers, Scott Warmann, Andy Strickland and Erica Weston provide pregame, postgame and intermission coverage.